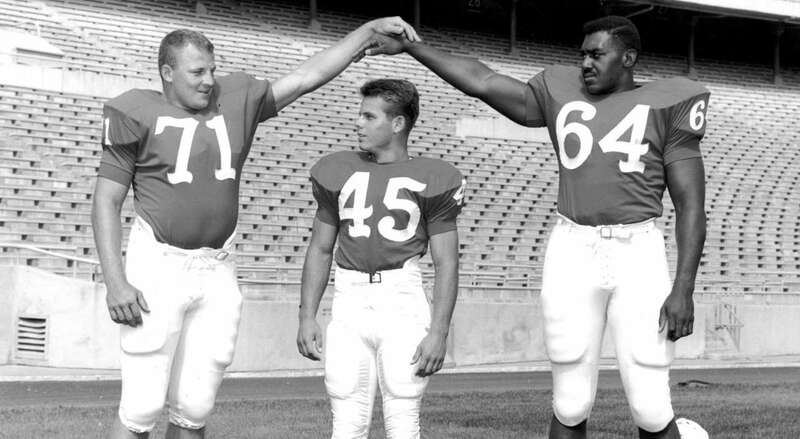 Frank Solich, Nebraskas pint-size fullback, set a Husker single-game rushing record 50 years ago this week. 1905: The Cornhuskers open the season with an easy 30-0 win over Grand Island. 1925: The varsity tunes up for Illinois with a ragged performance against the freshmen: 1, 2. 1930: Nebraska lacks its usual beef as just one player, Hugh Rhea, tips the scales at 200 pounds. 1940: Nine days before their opener at Minnesota, the Huskers tune up in a scrimmage that features four touchdowns. «1945: Joe Byler, a tackle on the 1941 and 42 teams, is awarded the Silver Star, the U.S. military's third-highest decoration for valor. 1950: The varsity rolls to 60-13 win over the freshmen a week before the opener against Indiana. Also, 13 players are slated for duty on both offense and defense. 1955: A week after a 6-0 loss to Hawaii that had Husker fans fuming, Nebraska puts up a good fight at sixth-ranked Ohio State before falling, 28-20. 1960: Minnesota dominates the Huskers in Lincoln, 26-14. 1965: Frank Solich sets a Nebraska single-game record by rushing for 204 yards in a 27-17 win at Air Force. 1970: The Huskers' passing game clicks in a 28-0 win over Army. 1980: Nebraska deals Iowa its most lopsided defeat in 30 years, 57-0. 1985: Doug Dubose rushes for 191 yards as the Huskers turn back Illinois, 52-25. 1990: NU dominates Minnesota on both sides of the ball as the Gophers fall, 56-0. George Achola and Derek Brown each topped 100 yards rushing. 1995: Damon Benning has a big day as Nebraska routs Pacific, 49-7. Meanwhile, the heat on the program intensifies with Sports Illustrated's Coach and Jury article. 2000: Eric Crouch ties a school record with five TD passes as the top-rated Huskers handle Iowa, 42-13. 2010: The Huskers struggle to a 17-3 win over lower-division South Dakota State.